There was a delightful write up in the Gloucester Times about the release of oysters raised in the upweller MOP operates with Maritime Gloucester. You can see the original article here. We were pleased to see that this project helped us achieve our goals of getting more oysters in the water and education as thousands of people reached. 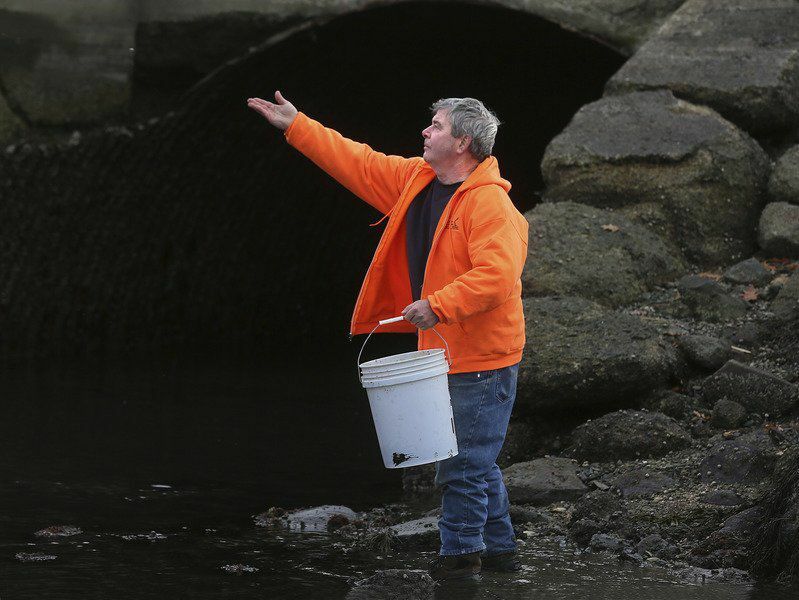 Mike Springer photo of Steve Parkes of Maritime Gloucester casting seed upon the waters. 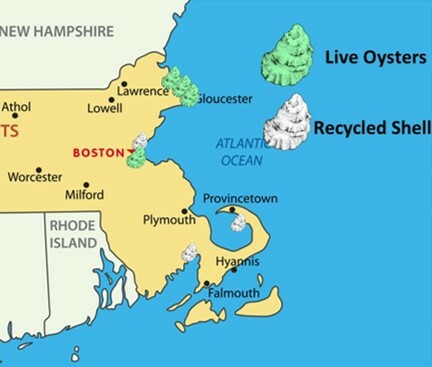 The Massachusetts Oyster Project has successfully transferred about 60,000 juvenile oysters into estuaries in the waters off Essex, Gloucester and Ipswich to cap off its first season. Now, it’s really up to the oysters. 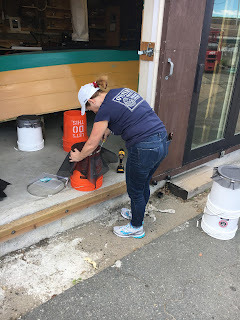 From July to November, the Massachusetts Oyster Project, in partnership with Maritime Gloucester, raised the oysters in a tank at the maritime education and museum on Harbor Loop. The tiny bivalves started off no bigger than a red-pepper flake and grew first to the size of a dime and then a nickel before being transferred into the wild. She estimates more than 5,000 students and 20,000 Maritime Gloucester visitors visited the oyster tank and learned of the social and environmental benefits of oysters. The project provided aquaculture training to Maritime Gloucester interns, volunteers and staff. 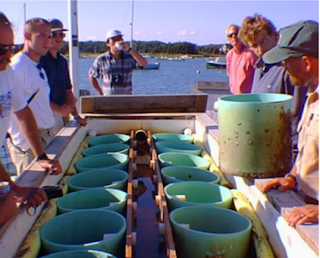 The project also formed an alliance with Salem State University researchers to monitor the growth and survival of the oysters in the Essex location. The oysters — standard Eastern oysters which are individually capable of filtering up to 50 gallons of water per day — now are the property of the individual communities, which will administer when and if they become part of the allocation annually reserved for public gathering. 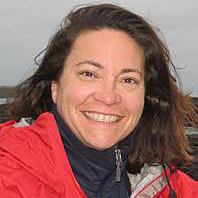 But, according to Filliault, the oysters will have had the chance to go through several spawning seasons before they reach harvesting size, thus helping organically expand the population in the waters in which they reside. “We’d like to see them stay in the water, spawn and multiply,” she said. Filliault said plans for 2018 include working again with Maritime Gloucester on growing another batch of oysters in Gloucester, as well as seeking out other locations and partners on the North Shore or elsewhere to expand the stock of oysters available for transfer. Over the past ten years, Mass Oyster has been focused on four goals. Raising awareness about the importance oysters and oyster restoration. Legislation to improve the Commonwealth's regulatory environment that has impeded our progress with actual restoration programs. This post focuses on where we have been actively working across our coast. Thanks to the hard work of our team the footprint is growing. 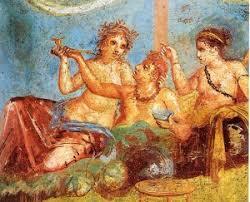 We have learned a great deal and achieved considerable success. We have been impressed how fishing groups around the country have been embracing oyster restoration to improve their catch. By using oyster restoration to create habitat and support the food chain the number and size of fish rises significantly according to academic studies. We have seen oyster restoration near fishing piers and in targeted areas in the Carolina's and Texas. To highlight the improvement and document it Sherwood, Maryland is organizing a tournament this fall on a restoration area. The Rod and Reef Slam will be on October 7 and has a variety of classes including youth and Kayak. Here is a bit more about the event. When an estuary loses almost all of its keystone oyster reefs like the Chesapeake has, the change causes fundamental damage. What has the Bay lost? We know from archaeologists that colonists in St. Mary’s City found sheepshead in abundance in the lower Potomac in the 17th century. How about black sea bass? Tautogs? Puppy drum (red and black)? Spadefish? Filefish? Some of those fish are turning up now in Virginia, mostly around the rocks on the tubes of the Chesapeake Bay Bridge-Tunnel. Some of them are beginning to show up on new reef structures in Maryland, including the reef ball field at Cook’s Point in the mouth of the Choptank. We want to celebrate this return, keep it growing, and give Maryland Department of Natural Resources (DNR) some data on recreational fishing opportunities around these restoration projects. Join us for a tournament that focuses on three restoration reef areas: the MARI Tilghman Island Reef just outside Knapps Narrows, the Harris Creek reefs, and the Cook’s Point reef ball field in the mouth of the Choptank. Multiple partners have worked together to build these reefs, including the NOAA Chesapeake Bay Office, Coastal Conservation Association, Chesapeake Bay Foundation and Maryland Department of Natural Resources. ENTRY FEE: $50 Includes tournament entry, after party food, giveaways, live entertainment and access to a cash bar. Register prior to September 15 to be guaranteed a free Rod and Reef Slam Tournament Shirt. YOUTH ENTRY: Youth ages 16 and under may participate for free with a participating adult. AFTER PARTY & AWARDS LOCATION: From 3:00p.m.–7:00 p.m. at Lowes Wharf Marina & Inn, 21651 Lowes Wharf Road, Sherwood, MD 21665. Shallow water anchorage at Lowes Wharf is available with water taxis to shuttle boaters to the after party. FISHING BOUNDARIES: Harris Creek Oyster Sanctuary, Cook’s Point Oyster Sanctuary/ Artificial Reef, Tilghman Island Artificial Reef. Coordinates for the fishing boundaries are forthcoming in the Gallery section of this webpage below. SPECIES: Any species may be caught. Catch, photo, and release all undersized fish. Refer to the restrictions set by the Maryland Department of Natural Resources and abide by the law. To register go to the link above. And if you have questions, you can email a contact. We are reposting this informative blog post. You can see the original post here. Although the Eastern or American oyster (Crassostrea virginica), a native mollusk with two rough elongated whitish shells, has been declared by many people around New York Harbor to be “functionally extinct”, the bivalve just doesn’t want to give up. In this arm of the ocean, the will to live seems to be strong in the little sea creature. The work seems to be paying off. Remarkably, I’m finding more and more adult oyster shells washed ashore along Raritan Bay and Sandy Hook Bay with juvenile oysters or spat attached to the surface. The other day while walking along the edge of Sandy Hook Bay in Port Monmouth I discovered a large oyster shell about seven inches long with five young oysters or spat fixed to the shell. One of a few notable finds this year. Another breeding season begins now, as adult oysters get busy making the next generation. The Eastern oyster has separate sexes, but oysters will always spawn simultaneously, usually in an entire bed of oysters. Both males and females need to live near each other in shallow tidal waters, in depths between 8 to 25 feet, if spawning is to be successful. Oysters spawn between late June to November, but peak spawning occurs between June and July when water temperatures rise into the 70s. When local estuarine water temperatures rise, an ancient spawning ritual begins. Mature female oysters release millions of eggs; the males release an even greater number of sperm. 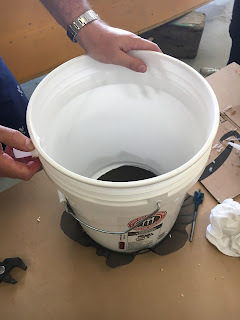 In less than 24 hours, the eggs will become fertilized and develop into microscopic free-swimming larvae that look just like specks of black pepper in the water. A single female Eastern oyster can produce from 75 to 150 million eggs in a single reproductive cycle, but only one in 1,000, less than one percent, will survive to reach the next life stage. It’s not just humans that have found the culinary delights of oysters. Most young oysters will become fish food. Yet, for those fortunate tiny black specks that do continue, they will spend the next three weeks or so drifting on currents and tides feeding on phytoplankton or microscopic algae. They will develop a thin shell and a slimy foot to help find a location in which to settle down and stick itself in place. It’s a lot of work and stress for a newborn baby to endure, but the hard work will payoff in a good home. 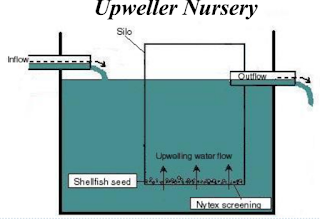 Oyster larvae will eventually attach themselves to a hard bottom substrate, preferably an adult oyster shell where other spat can grow to form a reef, but almost any firm surface will attract a juvenile oyster, such as a brick, an aluminum can, a glass bottle, or even a used porcelain toilet bowl. 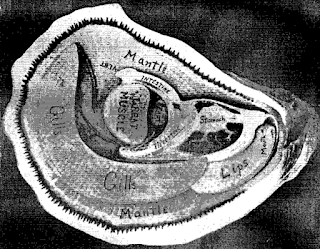 Once a baby oyster has found a perfect spot, it will secrete a liquid cement-like substance that fixes or glues itself in place to spend the rest of its life in one place. Most spat are usually males with some individuals transforming into females after the first or second spawning. 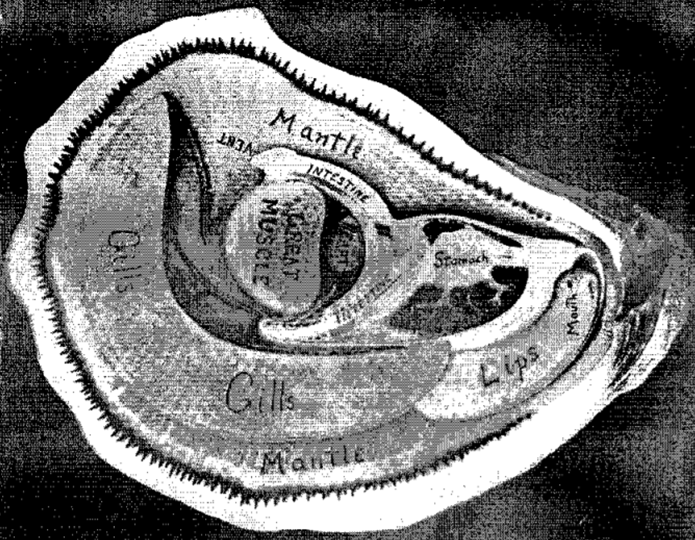 Oysters may go back and forth between sexes several times during their lifetime. An oyster can live between 10 to 20 years, but most will only survive about four or five years. It’s not easy being an oyster in New York Harbor. Virus and diseases, including QX oyster disease, are widespread due, in part, to continuing water pollution problems from raw sewage still entering the estuary from antiquated sewage systems. Oysters are more susceptible to disease when they are stressed by poor water quality. There are also plenty of hungry predators, including birds such as the American oystercatcher and gulls, and numerous aquatic dwellers such as oyster drills, sea anemones, sea stars, sea nettles, whelks, mudworms, and cownose rays. Yet, despite the challenges, the need to bring back oysters to New York Harbor is imperative. When a large number of oysters join together, it's called an "oyster reef.” Oyster reefs are diverse ecosystems that were once found all over the estuary and provided important protection for coastlines from the damaging effects of wave action from storms and nor’easters, they also provided vital habitat and shelter for many marine organisms. 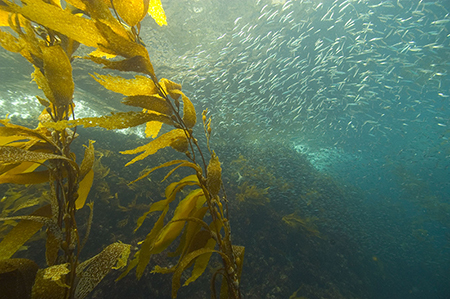 Science has shown that oysters reefs can be similar or just as productive as coral reefs. In one study in Beaufort, North Carolina more than 300 invertebrate species were identified to be living on local reefs. The nooks and crannies of the reef offer habitat to different species of worms, mollusks, fish, and mud crabs. The presence of these organisms attracts larger predators, which in turn attracts even larger predators, all the way up a food chain to humans. The existence of an oyster reef truly creates a dynamic environment. An oyster reef can also provide refuge from predation for many species, including small clams, grass shrimp, crabs, and worms. More over, oyster reefs stabilize shorelines and help reduce erosion, an increasingly important asset in an ever-warming world. 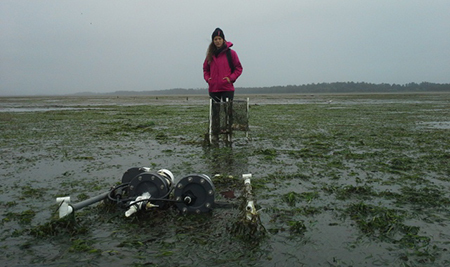 What’s more, oysters act as a filter to naturally clean up an estuary. Oysters use their gills to absorb oxygen and strain food out of the water. One adult can strain plankton and organic matter at a rate of up to 50 gallons per day (or 1500 times its body volume). A healthy oyster reef contributes significantly to overall water clarity in the estuary. It’s no wonder there is an important project in New York State to bring back a billion oysters into New York Harbor. Unfortunately in New Jersey, restoration efforts in Raritan Bay and Sandy Hook Bay and surrounding state tidal waters have been put on hold due to the lack of state funds. Let’s hope a new governor, which will be elected this November, will reestablish funds to help return oyster reefs to functioning ecosystems. This will help to improve water quality and benefit fish populations throughout the busy and bustling waters of New York Harbor for many species to enjoy. · Assist in reporting and monitoring all hatchery logs and records for accuracy. *Compensation and Benefits: Salary will be commensurate with experience. · This position will oversee the entire hatcheries algae personnel. *Compensation and Benefits: Salary 25-35K annual based on knowledge and experience. 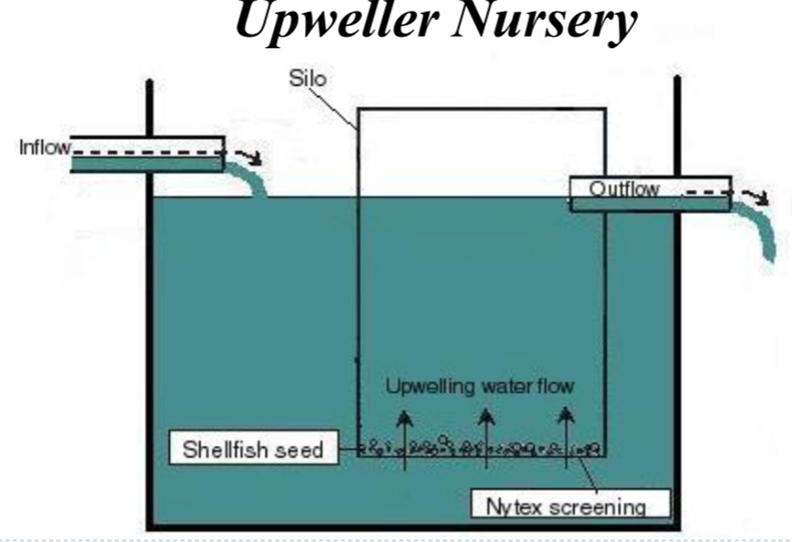 Duties involve all aspects of rearing both larval and juvenile clams in aquaculture nursery and are to include but are not limited to the following. · Clean and monitor feeding reservoirs and timer’s. 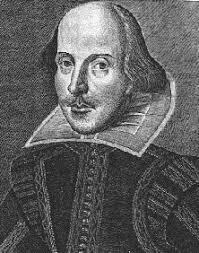 · Clean brood stock on established schedule and as needed, prepare and/or collect water for the following change. · Cleaning and assembling cylinders, tanks and associated equipment during and after sieving.